I’m always game for a period piece. I like using film as a medium to explore our history and to paraphrase an old adage, “Learn from it what we can and must.” With that said, if I’m being honest, the civil rights period piece in particular is a tad played out. There’s only so many ways you can tell what amounts to going through the same narrative tropes we’ve seen before. I would apply this same criticism to period pieces dealing in the Holocaust. As historical moments in our history and relatively recent ones, they are ingrained in our minds; we know what happens. Therefore, what do movies need to do? They need to present a new angle on a much-presented topic. And I think Lee Daniels’ The Butler achieves just that. 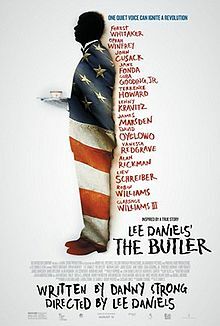 The film tells the story of a butler working in the White House and views his experiences therein and with his family (mostly that of his son) with the civil rights movement and the general black American experience of the time as the pertinent context. Essentially, we have two dichotomous approaches to ameliorating black plight in America between mostly the 1950s and 1980s. The butler, Cecil, as played sensitively and subtlety by Forest Whitaker, sees his role as to provide for his family and give them the best life he can. And to him, the best way to achieve that is by “serving the White man.” His reaction stems from his living arrangement in 1920s America. On the other hand, his son, Louis, as played by the quietly intense David Oyelowo, sees his role far more pivotal; he wants to change the world. He’s young, idealistic, sure, but it’s more than that. In essence, he sees his father as subservient to the whims of the White man or more bluntly, weak and he sees himself as the next generation mover and shaker the world needs, more specifically, the black man needs. Such a dichotomous approach to the institutional and cultural racism of the time creates quite apparent tension between father and son. Meanwhile, the alcoholic, adulterous mother played by the in-your-face, charismatic Oprah Winfrey, is caught in the middle. In utilizing this father-son dynamic to explore racism and protests of it therein, this film is uniquely able to sidestep many of the usual tropes associated with period pieces. Because as the film progresses and as the father understands the son and the son the father, likewise, they come to understand the larger picture beyond themselves and the greater social significance as such. To be sure, even though the film boasts, as one would expect, that it’s a “true story,” much of its central father-son story is dramatized for effect, but well, it works. I found the film utilized its personal story as woven into the greater historical context to great effect to tell an emotionally powerful, albeit, ultimately inspiring and hopeful story. If anything, I would say the film soars more as a commentary on family than it does on race, but alas, in any way you interpret it, one ought to agree, it’s nice to see Cuba Gooding, Jr. back in top form, as one of Cecil’s coworkers.